Today is a new day. Today is a day for you to begin creating a joyous, fulfilling life. Today is the day to begin to release all your limitations. Today is the day for you to learn the secrets of life. You can change your life for the better. You already have the tools within you to do so. These tools are your thoughts and your beliefs. In this book, I will teach you how to use these tools to improve the quality of your life. For those of you who aren’t familiar with the benefits of positive affirmations, I’d like to explain a little about them. An affirmation is really anything you say or think. A lot of what we normally say and think is quite negative and doesn’t create good experiences for us. We have to retrain our thinking and speaking into positive patterns if we want to change our lives. Every thought you think and every word you speak is an affirmation. All of our self-talk, our internal dialogue, is a stream of affirmations. You’re using affirmations every moment whether you know it or not. You’re affirming and creating your life experiences with every word and thought. Please realize that every complaint is an affirmation of something you think you don’t want in your life. Every time you get angry, you’re affirming that you want more anger in your life. Every time you feel like a victim, you’re affirming that you want to continue to feel like a victim. If you feel that Life isn’t giving you what you want in your world, then it’s certain that you will never have the goodies that Life gives to others-that is, until you change the way you think and talk. You’re not a bad person for thinking the way you do. You’ve just never learned how to think and talk. People throughout the world are just now beginning to learn that our thoughts create our experiences. Your parents probably didn’t know this, so they couldn’t possibly teach it to you. They taught you how to look at life in the way that their parents taught them. So nobody is wrong. However, it’s time for all of us to wake up and begin to consciously create our lives in a way that pleases and supports us. You can do it. I can do it. We all can do it-we just need to learn how. So let’s get to it. 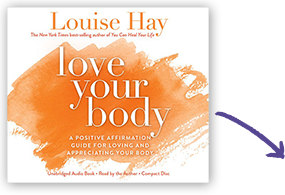 Throughout this book, I’ll talk about affirmations in general, and then I’ll get to specific areas of life and show you how to make positive changes in your health, your finances, your love life, and so on. This is a small book, because once you learn how to use affirmations, then you can apply the principles in all situations. Some people say that “affirmations don’t work” (which is an affirmation in itself), when what they mean is that they don’t know how to use them correctly. They may say, “My prosperity is growing,” but then think, Oh, this is stupid, I know it won’t work. Which affirmation do you think will win out? The negative one, of course, because it’s part of a long-standing, habitual way of looking at life. Sometimes people will say their affirmations once a day and complain the rest of the time. It will take a long time for affirmations to work if they’re done that way. The complaining affirmations will always win, because there are more of them and they’re usually said with great feeling.